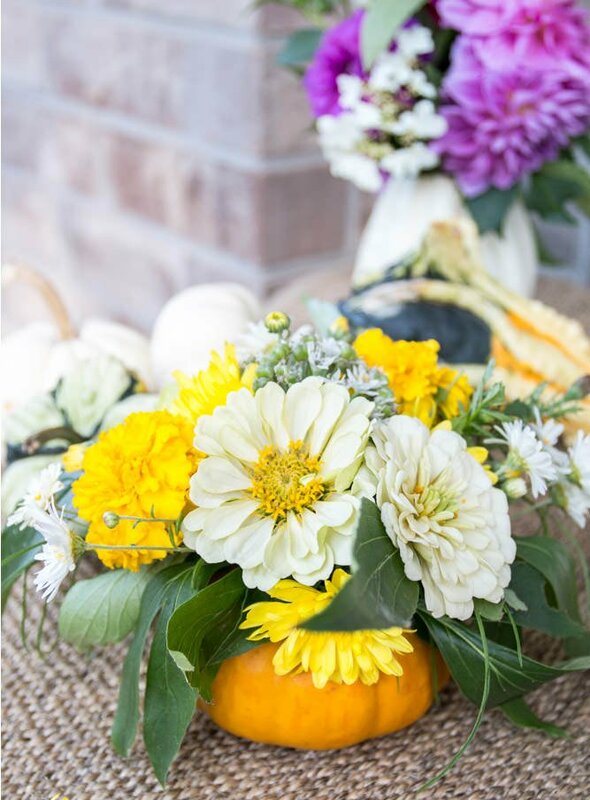 Grab a mini pumpkin & a bouquet of fresh fall flowers & turn them into some amazing arrangements in fresh pumpkin vases that your guests will adore! It’s been one of those weeks where I just wonder where in the world has the time gone? It started with a day of traveling by plane to my grandmother’s house where I’ve tried my best to be a good nursemaid. She had a total knee replacement an, in all honesty, I’m not great at caretaking but I’ve been doing the best that I can and that’s just how it’s gotta be, I suppose :) As I type this I’m more tired than I’ve been in a long time and more than a little bit stressed out but I’m also really grateful. Later as I was sitting and crocheting up a baby blanket on the couch Mimmie exclaimed that there were dogs acting untoward on her grass. And by being untoward I mean they were just there… she’s not much of a dog person like I am. :) Asking what kind of dogs, she told me “how should I know? It’s a kind of big one and a really little one.” I sit down on the stairs and start making kissing sounds to have an absolutely gigantic black great dane come rounding the front of her car in the drive followed by a definitely much smaller, but hardly “little” mostly white pitt lady. If you would have asked me to guess what kind of dogs she saw using her description, I was thinking like something no bigger than a labrador and chihuahua pair. 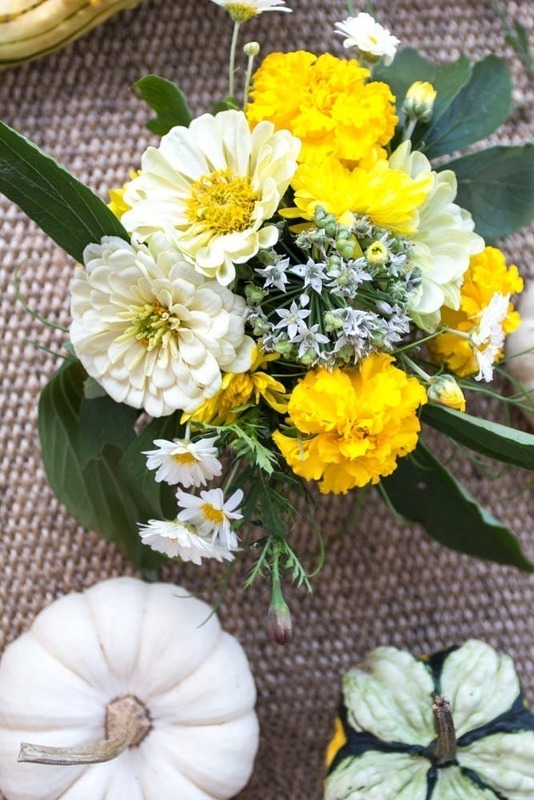 But back to that feeling today… that crisp, cool fall feeling, it totally inspired me to embrace all things fall including pumpkins and chrysanthemums and their place in gorgeous fall decor. 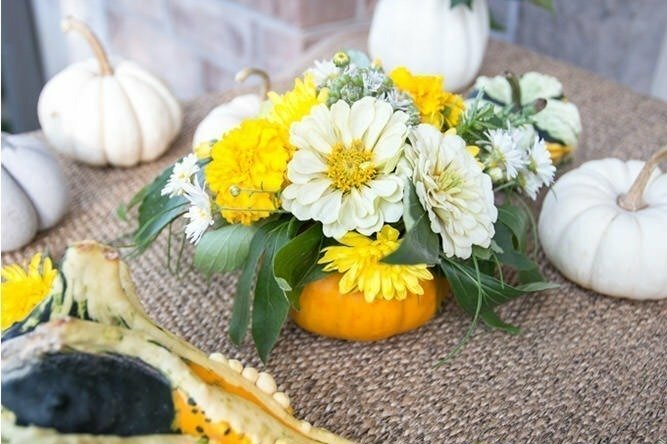 Did you know that you can turn a pumpkin into a vase? 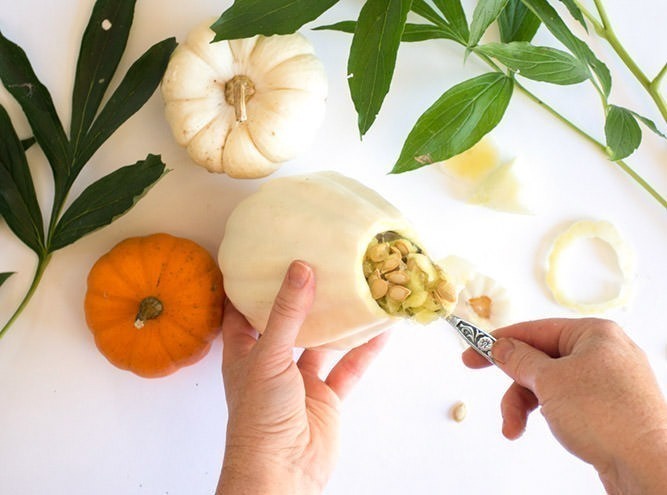 You totally can and it’s easier than even carving a pumpkin. Plus if you clean them out well they will last for weeks making them not only seasonally amazing, but also super economical. Have I sold you, yet? I have, haven’t I?!? 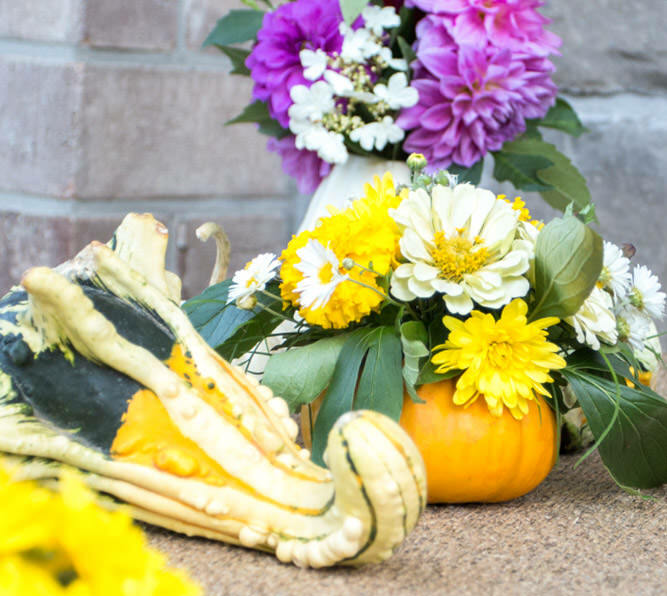 Grab the paring knife and let’s carve up some DIY fresh pumpkin vases in about 15 minutes! Using warm and soapy water, wash the pumpkin’s surface and allow to dry. Slice a very thin layer off of the bottom of the pumpkin so that it sits level. Be sure not to cut too deep! 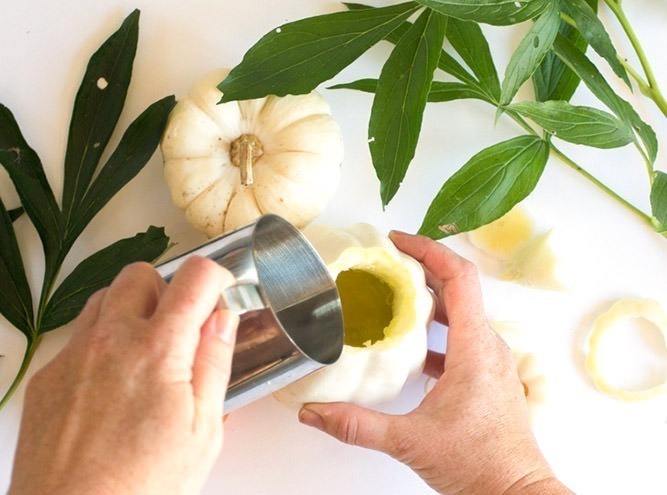 This step is optional and only necessary if your pumpkin is wobbly from the get go. 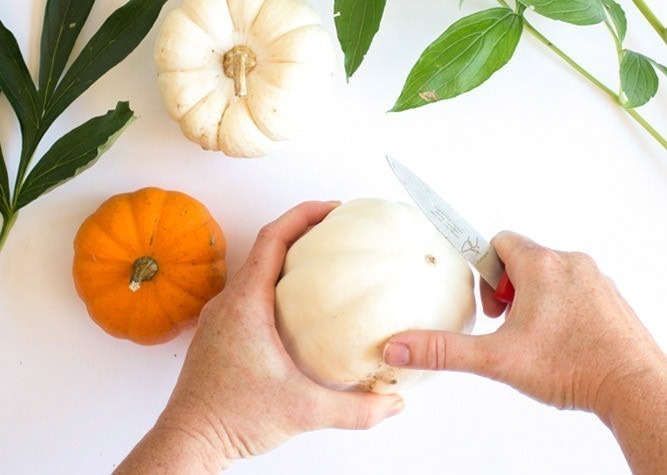 Using a sharp paring knife, cut a small round opening around the pumpkin’s stem. Cut down until you create an opening in the pumpkin’s cavity. 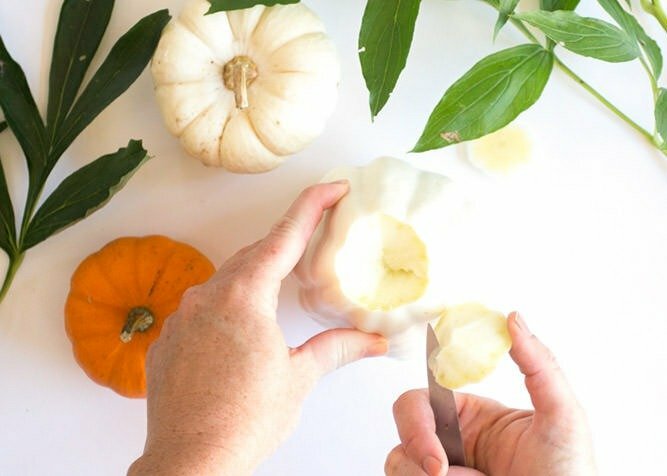 Add water to the inside of the no vase-shaped pumpkin. 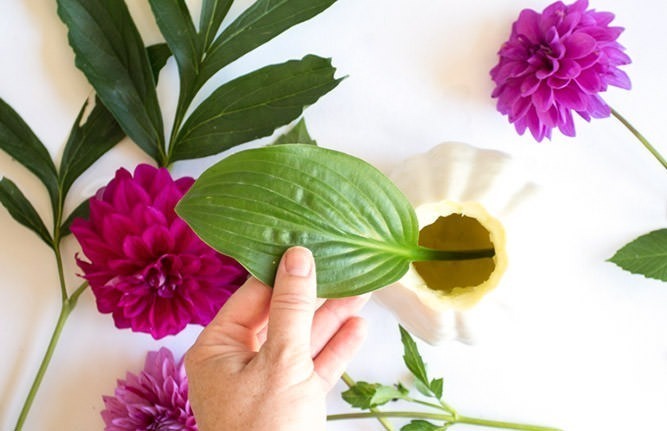 Arrange the florals in the vase first starting with greenery. Next place your largest stems in the center. Fill out the arrangement by adding shorter flowers around the outside and as needed. 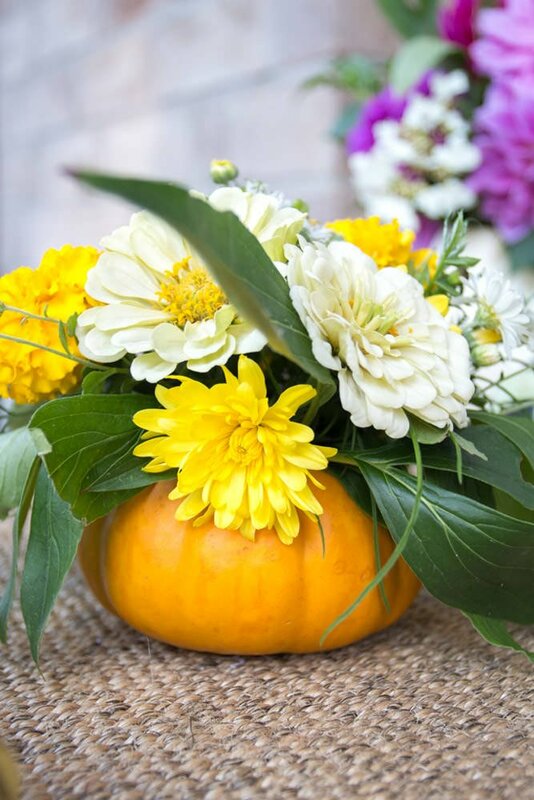 These pumpkin vases will last up to 2 weeks but your flowers will likely need to be changed out a time or 2, depending on how hardy they are.